Did you hear about my giveaway? No?? Well I have TWO giveaways today! UP FIRST! 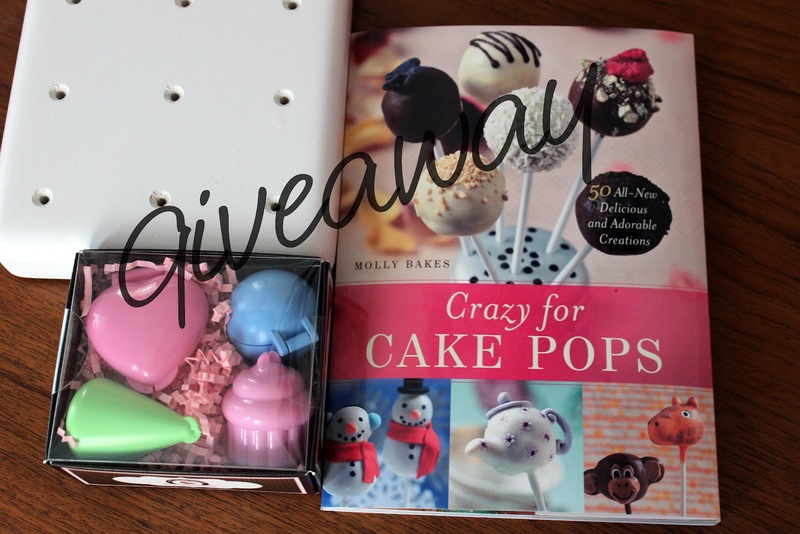 KC Bakes has a white 12 pop cake pop stand for you and I’m including some cake pop molds and a cake pop book! SECOND – I’m very excited to be attending my FIRST Blog Conference! It’s an conference hosted ONLINE and the best part is it was on $15 to sign up! The conference will be held October 22-24 in YOUR LIVING ROOM! That’s right – show up in your best yoga pants and log-on from home. You may still want to get a sitter for the kids (I am) or set up a play-date next door, but you don’t have to pack a suitcase and catch at a flight at 6am! So what are you waiting for? Sign up and learn how to build your blog! Ok… on to these Awesome Cake Pops! These are actually not CAKE cake pops – They are still the Little Debbie Pumpkin Delights Cookie Pops. I wanted to show you another cool Halloween design and how to use the KC Bakes Cake Pop stand when you are using straws in place or your sticks. After you form you cake balls, you are going to add the straw the same way as a stick. Dip 1/4 inch of the straw into the melted candy and then insert the straw half way into the ball. I think that a 12 inch straw is a bit LOOOOOONG, so I cut mine in half and insert the cut end. To stand up the straw, place your lollipop sticks into the cake pop stand. Dip your cake pop and then slide the straw over the stick. Even if you leave the stick long, it’ll still hold the pop upright and allow for smooth drying. I used the Wilton Sugar Sheets and a small cat paper punch to cut out the cat shapes. Once the pops were dry, I added some yellow full moons and crescent moons and attached the cat silhouette. For the full moon, I just dipped the pop into the yellow candy. To make the crescent moon, I used a lollipop stick to draw on the crescent moon. You could also put the yellow into a baggie and pipe it on if you are going to do a lot of pops. Aren’t these fun? Best part is, they are super easy to make and all your Trick-or-Treaters will be in awe of your mad cake pop skillz! ** Sorry, I can’t find the paper punch online. I bought it at Micheal’s Craft Store recently. I found the paper straws at Target in the Party Supply area. I like to link up with THESE PARTIES! Check them out! I hope you never ever ask me to pick a favorite because every cake pop you make is just too stinkin' cute and these are no exception! I LOVE those straws! And your idea for using the sugar sheets. These are so cute! Very cute idea- Love the use of the sugar sheets! So I had zero idea they had edible baking paper (!!!) until your Lil Debbie Pumpkins post. That is SO freaking cool! And these cats are too adorable, Karyn! I love that you added moons to them. You need to get over to the cake area in Micheal's more often. They also have stamps for cakes. It's a huge sponge stamp that you put food coloring on and then stamp you fondant. Haven't used it yet, but it looks interesting. I absolutely HAVE to try and make the Halloween cats – you are so creative!! OMG, I love your Halloween cake pops! The straws and the moon and cat are all so spooky! Very fun! My favorite design is the red and green sparkle pops, they are simple but so perfect for the holidays!!! I love the I Love You pops! Simple yet classy. Your Halloween Cat Cake Pops are just adorable! Hope you are having a great weekend and thank you so much for sharing with Full Plate Thursday. Super cute! So glad you're going to Online BlogCon! Thanks for sharing at Pin It Thursday! Live these cat cake pops!! They are so fun, smart to use those straws too! the pops are so cute! love the fun sticks too! Super cute! I can't wait to try out that sugar paper. Thanks so much for linking up to Creative Thursday. Can’t wait to see what you share this week! Have a wonderful week. These are too adorable! I love the halloween straw sticks – they are the perfect touch! Thanks for sharing them at our Keep Calm & Link Up party! Hope to see you again in a couple of days for the next one! You are absolutely amazing at making cake pops!! These are so cool!! Thanks for linking up to MTM Mondays!